Home >> Generated from JAN's SOAR Information System on 4/21/2019 12:10:39 AM. Specially designed to make tasks easier, such as turning on taps, opening/locking doors, turning stove knobs, dishwasher or washing machine dials. 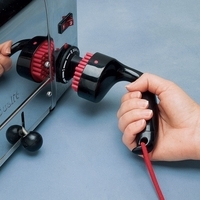 Designed with an ergonomic handle that allows the user to grip with both hands if leverage is needed on hard-to-turn knobs. The hexagonal pegs provide a good grip due to the large gripping area. Handle is made of ABS plastic and pegs are made of Polyamide plastic.